“Months after Kreshnik B. slipped over Turkey’s border into Syria in 2013, convinced that it was his duty to help the people overthrow President Bashar al-Assad, he found himself desperate to go home. In a lengthy confession read in a Frankfurt court, the 20-year-old, wearing a black T-shirt and hoodie, said he realized that he could “achieve absolutely nothing” in Syria. Upon his return to Germany, he was immediately detained on suspicion of belonging to the Islamic State. He agreed to confess and provide details about his experiences in Syria in exchange for a more lenient sentence, to be handed down when his trial ends next month. “I want to use the time in detention to either finish my vocational degree or otherwise continue my studies,” the young man told the court. “After my time in detention I want, as they say, to live a totally normal life,” he said. 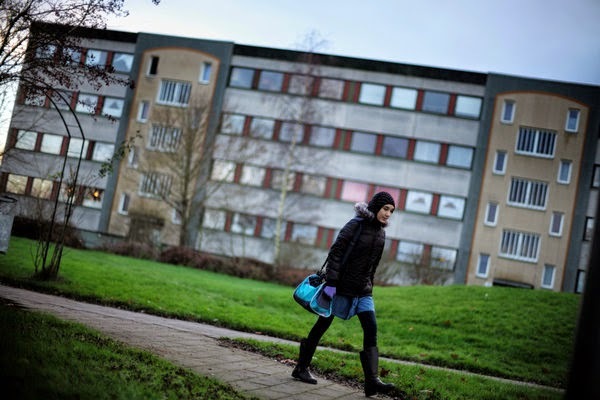 Many who left to fight in Syria came from middle-class residential neighborhoods like Rosenhoej, on the outskirts of Aarhus. Since his return to this tranquil port city from the battlefields of Syria, he has been part of a pioneering program that treats onetime fighters not as criminals or potential terrorists but as wayward youths who deserve a second chance.The program, closely watched by authorities around Europe, involves counseling, help with readmission to school, meetings with parents and other outreach efforts. “What we are doing seems to be working,” said Jorgen Ilum, the chief of police for the region. Erhan Kilic, a Turkish-born Aarhus lawyer and observant Muslim who acts as a mentor, said the biggest hurdle was winning trust. If this can be done, he said, “You can move their ideas in a moderate way” by exposing the flaws in their interpretation of their faith. “The problem is not the message of Islam; it is individuals who cause all the problems,” he said, noting that young recruits to militant Islam often know little about their faith and pick up their views from watching videos of incendiary preachers on YouTube or from schoolyard chatter about the West’s humiliation of the Muslim world. Remember: Collateral damage (bombing a site and killing innocent persons in the process) is prohibited in Islam. Suicide (Suicide bombing) is prohibited in Islam. For a parallel to “Collateral Damage”, consider “War Crime” . Two groups of armed Forces can fight in a war. But when Armed Forces start killing unarmed & innocent civilian people in a war, that’s War Crime. Do you know what Lawyers fight over in Courts? “Interpretation” of the same Law in different ways – same legal statement in the book of laws – but varied interpretations. So always, keep an eye over whether Islamic teachings are misinterpreted. The same Quranic Ayah could be interpreted in different ways. My suggestion: consider the “Context”; not just the context of the Surah (Chapter of Quran), but also interpret in the light of the context of the time and situation during which the Surah was received by Prophet.